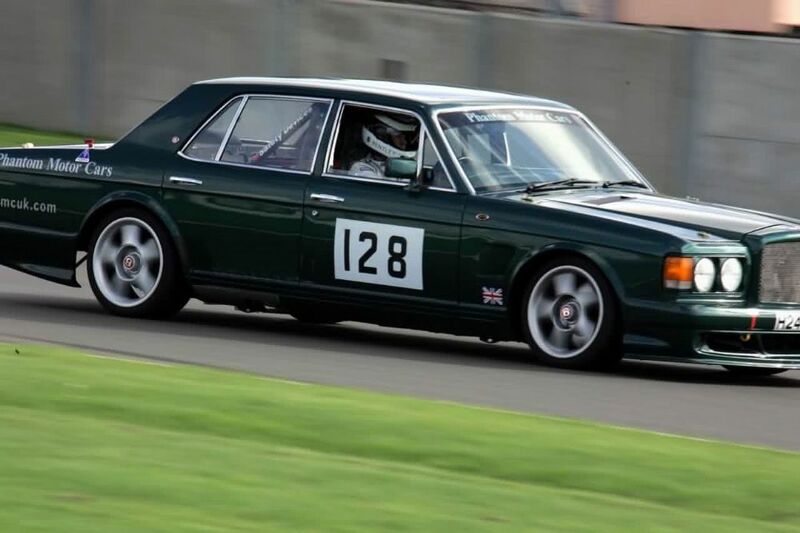 Race Meets – Phantom Motor Cars Ltd. 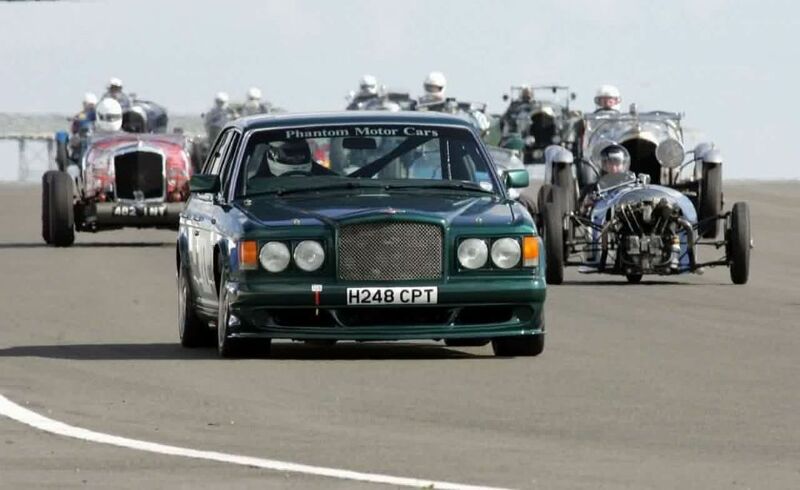 The first official outing for the Bentley was June 2003 Le Mans 24 Hour race with the Bentley Drivers Club. A last minute rush was required in order to complete all necessary works. This was the test of durability. For this trip, the boost limiting was reinstated. 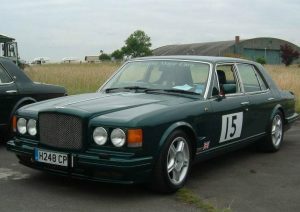 However, the rev limiter was still reached in road tests in top gear prior to the trip to France. The trip to Le Mans and Saumur with the BDC was an outstanding success. A great long weekend was had by all. 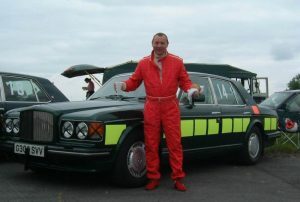 The Bentley Turbo R Racing, attracted a lot of attention and comments. The Racing Turbo performed faultlessly, covering approximately 1,500 miles. We were also fortunate enough to drive the full 24 Hr Le Mans Circuit (Le Sathe) the morning of the race, Bentleys sharing the circuit with Jaguar. Some good video was taken with some slightly hairy moments on some of the bends. Not Surprisingly, enthusiastic Bentley drivers seemed to end up at the front, just behind the Pace car. Lap times in practice sessions 1m16s and improving – then !! – Melt down. Original engine block, vapour blasted. New crankshaft, pistons, rods and liners from a red label engine. 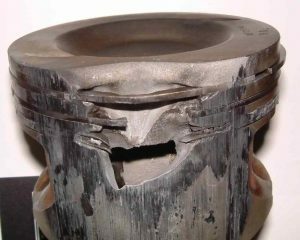 All pistons, rods and gudgeon pins were balanced to 0.01g. This balancing exercise showed what low balancing tolerances Bentley originally found acceptable. We found a difference of 10g between the lightest and heaviest piston and rod assemblies. Crankshaft, drive plate and front pulley also balanced. I guess it was too lean then. Too much boost and the injection system reached its maximum capacity. We now have to find a way of increasing the fuelling capacity at maximum boost. However, by rebuilding it, we should have a better engine for 2004. Lets just hope we don’t have a repeat of this picture! Water cooled charge cooler with electric circulation pump. Turbo RT Mulliner front and rear bumpers with front lower splitter. BDC Silverstone race meeting – 21st August 2004. Bentley, Vintage & PVT Scratch – Race No. 7 – 10 Laps. Bentley Handicap – Race No. 9 – 8 Laps.